Every year since 1926 the Libramont Fair has been held in the southern Ardennes region of Belgium, an area of dense forests and rolling hills. The forests much resemble the Pacific Northwest rainforests in the US – thick, bright green, and wet. The idea of the first Libramont fair was to promote the Ardennes draft horse. Named after this mountainous French-Belgian border region, the Ardennais originated centuries ago. It was used until the 1800's for draft work and riding; it was used in wars as a draft horse by the military up until World War I. 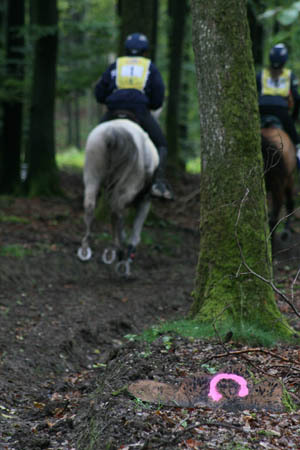 Today the Ardennes draft horse is still used for work in the forest – where the hills might be too steep and slippery for a tractor, the draft horse is safer and more efficient. The second Libramont Fair in 1927 had 160 horses, 3 exhibitors and 10,000 visitors; today the Fair has some 750 exhibitors, 3500 animals, almost 170,000 visitors. In addition to agricultural, livestock and forestry industry exhibits and animals, the Fair holds equine events such as breed shows, jumping competitions, pony games, driving competitions, draft pull competitions, and endurance. Coinciding with the Libramont Fair for the second year was the Belgian Junior Championship CIEO*** J/YR 126 km. There was also a CEIO*** 126 km (open) and a CEI**109 km ride. Both 126 km rides started at 6 AM, and the 109 km ride started at 6:30, in the rain. 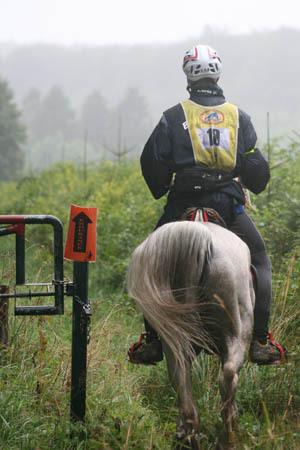 Think wet, mud, gray skies, rain, and more rain – endurance in Belgium! I'd come to the ride with Belgian endurance riders Barbara and Robert, friends of Leo's and Caroll's. Leo and Caroll left for the ride in Malaysia, so Robert and Barbara picked me up on Friday evening, and early Saturday morning (after a record 2 ½ hours of sleep), we made the start of the rides. It had started raining during the night, and was still raining steadily; already the dirt tracks were muddy and the grass tracks were soggy. The heavy gray skies made the start look less like morning than it did dusk-to-darkness. 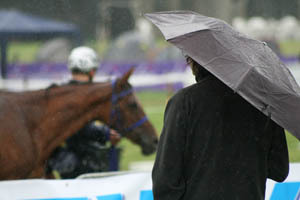 Riders were hunkered down under their helmets and in their raincoats on their horses. 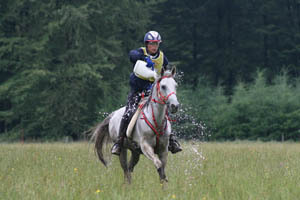 In Malaysia I had met Dutch endurance rider Jeanne Linneweever from the Netherlands, and I was going to be leaving Libramont with her on Sunday. 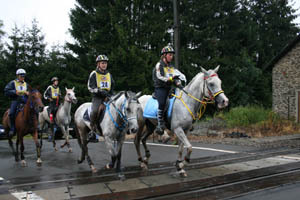 She was riding the 109 km, but in the dark and rain and with raincoats and helmets, I didn't even see her on her horse. 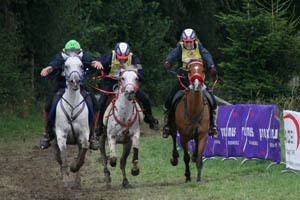 The weather didn't seem to affect the participants however; horses were amped and riders were cheerful and optimistic as they left the grounds following a lead car out on course. Horses all wore a timing band on their leg, which Chronorace used to electronically track the horses in and out of the vet gates. Not everybody's stayed on... Jeanne found one in the mud on trail. The riders in the 126 km ride had 4 loops, of 40 km, 30 km, 26 km, and 30 km, with a 40 minute hold between each loop, with pulse criteria of 64 in 30 minutes. The riders in the 109 km had 4 loops of 40 km, 30 km, 26 km, and 13 km, with pulse criteria of 64 in 20 minutes. As the day went on, everything and everybody got wetter. It got a little cool with the strong breeze at times, if your raincoat was soaked through. Which mine was. My “rainproof” Aussie hat is not Belgian rainproof. I think it held more water than my shoes. But nobody really looked like they minded the rain – it is Belgium after all, and most of the people there were used to it, and to me, it's just like 'home' – Seattle, rain rain rain, you just go on doing your thing, it's just a part of everything. And people were quite friendly, always a smile, always a hello. They seemed to enjoy being there, even the crews for the frontrunners throughout the day. 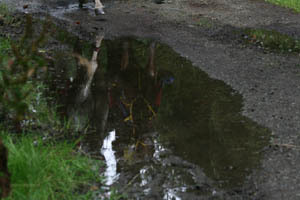 The tracks for the horses, however, got worse and more treacherous as the rain continued. The first crew point we went to on the first loop was at a place where riders crossed a set of railroad tracks. Some horses spooked as they came to the wood and rails crossing the paved road; some slipped on the wet greasy wood, and some horses leaped in the air – as if they were electrically shocked. They were! If a horse stopped on one of the metal rails at one spot, he got a good shock, figuratively and literally! The rain stopped around noon, and blue skies even punched a few holes in the clouds, but not for long. The clouds came back, though the rain held off. That didn't dry the track out any, however. Each loop horses dropped out due to lameness. After two loops, the leaders of the 126 km Junior ride emerged from the pack, staying close together: the French riders Andrea Pulicani, Jean Daniel Aiello, and Julien Lafaure, and Italian Girodano Bottiglia. 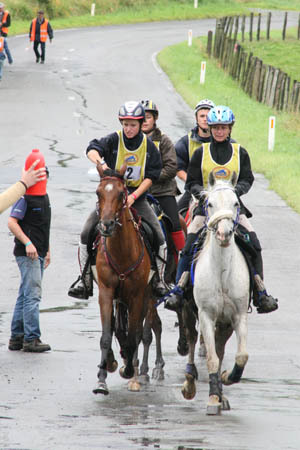 Coming into every vet gate, Julien Lafaure was off his horse running beside it, keeping up with the other riders, over the finish line and straight into the crewing area. On the last 30 km loop, Girodano was in the lead and looking strong, when his horse slipped a shoe. His crew made like an Indy 500 pitstop, swarming the horse with farrier, tools, and assistants (while others took advantage of watering the horse and cooling it down). Precious minutes ticked away, as they quickly fixed the shoe; Girodano watched as the horses behind him passed him and continued cantering down the trail. It probably cost him the race, but then, that's the way it goes. Sometimes it's just not your day! The finish was an exciting one with 3 French juniors duking it out, 3 across the finish track at a gallop, with Julien Lafaure just barely nosing out Andrea Pulicani, who was a scant half-length over Jean Daniel Aiello. Fifteen minutes later, Italian Girodano Bottiglia crossed the finish line, with Vanessa Hoebeke in 5th, the first Belgian junior finisher. Fourteen of 24 finished the Junior race, with lameness being the leading cause of vet outs. Belgian junior Louna Schuiten must have had the hardest day of all, finishing in 8th place, but watching her horse vet out at the finish on metabolics. Coming in just 20 seconds behind the top 3 racing juniors was the winner of the senior 126 km, was happy Belgian Mariza Periera, her first 120 km ride for her and her horse. Six of the 9 starters finished the senior 126 km ride, with Belgians taking the top 4 places. I missed all the 109 km riders, since Barbara and Robert and I followed the course of the 126 km ride. Rachel Jaumotte from Belgium won the 109 km ride, in which 3 of 12 finished. Jeanne Linneweever was in the lead coming in off the third loop, when her horse Ricki's Macho Man vetted out lame. He'd slipped and pulled something in his shoulder. It was only slight, and it was only the second time in his career he'd vetted out. She said later this might have been the toughest ride she'd ever done due to the wet, slippery conditions. It made for a different kind of challenging endurance ride! Yes, you can quote this blog entry. Now I better start tweeting!